Abraham Rosa CU, for example, is handing $200/per day/member so they can take care of needs. Most CUs have no cash now. Hard for staff to get to them and lots of staff had losses in their homes. He may be able to just open through tomorrow as they are running low on diesel fuel. Diesel is used to fire up the electricity generator for his branch, but gas/diesel is in very limited supply. There are no armored trucks to carry cash either and physical security is not guaranteed. There is no on-line ACH transactions. The only way they are clearing is through Banco Cooperativo, which is linked to the Fed and banking system. Luis’ employees take a USB drive and physically go to Banco Cooperativo for the clearing. It takes 2 hours to do this, so all clearing is behind by at least one day. Banks and other financial institutions are going through the same. There is a curfew from 9-6, so people basically sleep in the line they may happen to be (water, ice, gas). It’s desperate and it feels like it’s never going to get back to normal. He said, pray for us. According to Corro, WOCCU is now coordinating relief efforts with the National Credit Union Foundation and the New York Credit Union Association. CUNA Mutual Group, which has had four disaster response team members in Puerto Rico since Saturday, said they have accounted for all of their 12 employees based in San Juan. “We are relieved to be able to say that we have been able to successfully account for and make contact with all 12 of our employees,” Beth Cutler, community relations and foundation leader for CUNA Mutual Group in Madison, Wis., said. “We know that they are safe. We’re obviously dealing with a long road to recovery, but our employees are all accounted for.”Cutler said CMG’s disaster response team determined employees are in need of critical emergency supplies such as satellite phones, solar chargers, ready-to-eat emergency meals, drinking water filtration systems, first aid kits, flashlights and batteries. Cutler said those supplies will be flown to Puerto Rico.To assist CMG’s credit union customers, she also said additional disaster response team members are expected to travel to the island as soon as they can secure flights.“As with many people we are trying to keep on top of this situation,” she said. “As communications start to improve, especially now since we will get satellite phones into all of our employees’ hands, we will continue to be on the ready to make sure we are assessing the needs moving forward. Like many other people we don’t have a lot of specifics, but we will continue to pay attention to that to see what’s next.”CMG said it will match every dollar that is donated by their employees for a total of up to a maximum of $500,000. Those funds will be used for immediate recovery efforts.“CUNA Mutual Group is resolved to be there not only today but in the months to come as recovery efforts are identified,” Cutler said. According to an email update from B. Dan Berger, NAFCU’s president/CEO, he stated, "We reached out to members (and nonmembers) but there is little to no cell, internet or electricity. No running water is also a problem. "Late on Tuesday, the NCUA released a statement that said, "As Puerto Rico and the Virgin Islands work to recover from the destruction of Hurricane Maria, the National Credit Union Administration has resources available to help credit unions affected by the storm. 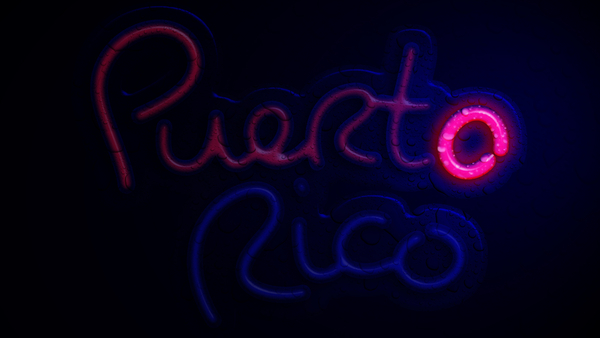 "The NCUA has eight federally chartered credit unions in Puerto Rico and five in the Virgin Islands. "NCUA examiners have been working to stay in contact with those credit unions, determine their status, and offer assistance as-needed," the statement read.The NCUA’s Office of Small Credit Union Initiatives can provide urgent needs grants of up to $7,500 to low-income credit unions that experience sudden costs to restore operations interrupted by the storm.According to sources contacted by CU Times, few if any credit unions have been able to apply for grants or funds due to the lack of electricty on the island. I’m not the first to argue that technology has put the social skills of American consumers on life support. Take a look around, and you’ll notice people spending their days hiding behind their mobile devices, using them to order toiletries and groceries, communicate with their friends and coworkers, line up a date for the weekend and book a hair appointment. All without speaking a word. Some of these individuals are not even visible to the public eye – thanks to the rise of e-commerce, any product or service can be delivered to one’s door. Why even leave the house? When it comes to banking, cowering behind a mobile device is an acceptable option as well. Mobile banking apps, remote deposit capture, chatbots, text alerts and other forms of self-service functionality have lessened the need for human contact. And that means credit union branches are destined to suffer the same sad fate as old Blockbuster and Sears stores, right? Those social skills may have a fighting chance after all, because the branch is alive and well, and it’s getting a major facelift. Gone are the days of the stale, sterile-looking branch with the Disneyland-like line leading up to a row of teller counters. Today’s branch is warm, welcoming, high-tech, interactive and helps foster a sense of community. And it’s time for more credit union members to change out of their sweats, come out of hiding, join other real, live people and take part in it. Of course, no one should have to leave the house to deposit a check. Online and mobile banking were game-changing inventions that bought people valuable time. But for those bigger plans and decisions – buying a home, investing, saving for retirement – a Google search can’t replace an in-person meeting. Speaking of community, since arriving in Portland, Ore., earlier this year, I’ve taken the time to meet and get to know a number of credit union people in the area, most recently Danette LaChapelle and Evan Strandburg, SVP of marketing/CCO and business development manager for IQ Credit Union. IQ is expanding its footprint from Washington State into Portland by opening a branch in the hip North Williams neighborhood to serve its growing number of members who live, work and do business on both sides of the Columbia River, which divides the two states. After meeting for coffee and donuts, they took me by the under-construction branch, and I asked them why their members value a physical location. It turns out 60% of IQ members still conduct transactions in a branch, and their branch-goers are multigenerational, as boomers only make up a 2% to 4% larger chunk of the group compared to other generations, according to LaChapelle. Millennials are even coming in for basic transactions – she noted those who work part-time or freelance jobs, or don’t receive direct deposit, often come in to cash checks because they can’t afford to wait out a check hold period to use the funds. (This, of course, doesn’t give millennials points in the financial stability department, but it at least shows they’re not averse to face-to-face help.) She added while the number of in-branch transactions is not going down, membership is growing, meaning members are still coming in but not as much as they used to. “We’re bringing people into local businesses while promoting financial education,” LaChapelle explained. Access to convenient branches is a high priority for consumers in all demographics. But branch economics are changing. It’s now more challenging than ever to provide local and nationwide branch access while still generating revenue and driving growth. CO-OP Shared Branch is the second largest branch network in the country, with more than 5,600 credit union branches and hundreds of self-service Shared Branch express terminals in all 50 states. The CO-OP Shared Branch network allows members of one credit union to do a range of transactions at another credit union. Through the CO-OP Shared Branch network, participating credit unions can serve members in diverse geographical locations, even when they move or travel. CO-OP Shared Branch express terminals provide after-hours member access, reduce teller traffic, and can help you leverage your existing investment in ATMs. A new survey says that personal contact in the branch still matters greatly to credit union members. It wasn’t that long ago — the first quarter of 2015 — that the number of total credit union members first eclipsed 100 million. Since then, the number of credit union members has continued to climb, to more than 107 million as of third quarter 2016, according to data from Callahan & Associates. Clearly, credit unions have become a popular alternative to retail banks. Why? In December, TimeTrade, a provider of appointment-driven personalization, released the results of its 2016 Credit Union Consumer Survey. In it, more than 1,000 members answered questions about their experience with their credit union. “We were looking to identify the most important things for members when choosing a credit union and how those institutions are doing matching those expectations,” says TimeTrade vice president Lauren Mead in an interview with CreditUnions.com. According to Mead, respondents were broken down evenly by generation, with roughly a quarter of respondents fitting into either Gen Z (ages 18-20), Millennial (ages 21-35), Gen X (ages 36-54), or Baby Boomer (ages 55-71). When asked what the most important factors are when choosing a credit union, 70% of respondents chose rates, 65% chose products and services, 62% chose location/hours, 56% chose reputation, and 15% chose size. Yet, despite the fact that the initial attraction between consumer and credit union is based on price, it’s the personalized service credit unions offer that keeps members around and engaged. HOW DO YOU LIKE TO INTERACT WITH YOUR CREDIT UNION? Source: 2016 Credit Union Consumer Survey. 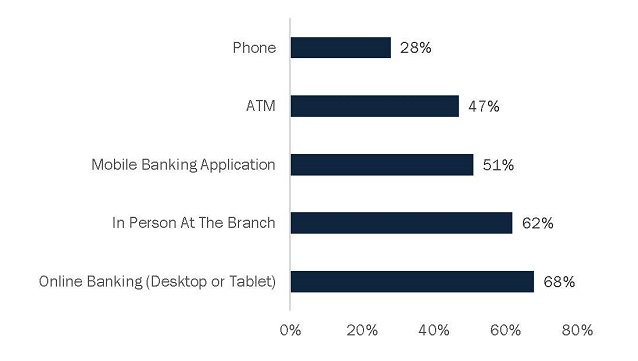 So while 68% of respondents indicated they like to interact with their credit union through online banking, 62% said they like to interact in person at a branch. In addition, 43% of respondents said they visited their credit union more than 10 times in the past year, while 30% and 21% said they visited more than five and less than five times, respectively. Only 6% said they did not visit their credit union at all in the past year. When they do make it in the branch, respondents felt as though their experiences were well met. That’s good, because 41% of respondents indicated they desire personalized service — compared to 35% for bank customers, according to TimeTrade’s 2016 State of Retail Banking survey. The survey found that 85% of credit union survey respondents feel as though they have a personalized experience when visiting their branch — compared to 79% of bank consumers who feel the same — and 63% feel the credit union employees they interact with are always knowledgeable and helpful. DO YOU FEEL THE CREDIT UNION EMPLOYEES YOU MEET WITH ARE KNOWLEDGABLE AND HELPFUL? It seems reasonable to assume that it’s this competent service that allows members to feel comfortable waiting longer times at branches and preferring teller interactions over automated transactions. Per the survey, 46% of respondents are willing to wait between five and 10 minutes to complete a transaction, while 38% are willing to wait 10 minutes or more. 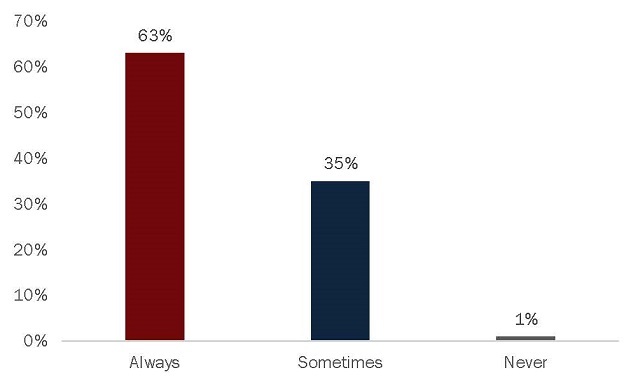 In addition, 67% of respondents, when asked how they felt about experimental branches without tellers where every transaction is automated, said they would rather speak with a teller. Millennials are more likely to visit a credit union branch (57%) than a bank branch (48%). 49% of millennials visit a credit union to open an account. 43% of millennials value personalized service from a credit union more than a bank (34%). 77% of millennials would be willing to schedule an appointment to come into a credit union. 88% of millennials would visit their credit union during the week if they were guaranteed a specific appointment time. According to Mead, these data points show that while millennials are willing to embrace technology, they still value personal, face-to-face conversations before making financial decisions. > Remind your members to update their contact information as well as their current ID to ensure a smooth shared branching experience. > Hurricane Plus is an interactive guide to get your personalized hurricane survival guide with evacuation and storm surge zones. Just key in your address. > Click here for Disaster Recovery Procedures It's recommended that you print these procedures prior to the storm and review with staff. > 2017 Hurricane Seasonal Preparedness Digital Toolkit Is a great tool to share with your members. Updated weekly on Tuesdays based on the information by CO-OP Shared Branch. All Central Florida shared branching credit unions have returned to normal business in all branches. 121 Financial FCU - All branches are OPEN with exception of the Courthouse Branch. JetStream FCU - Branch in Carolina, Puerto Rico remains closed Thursday, Sept 21st and will re-open when it's safe to do so. All West Coast shared branching credit unions have returned to normal business in all branches. Space Coast CU - 1 branch remains CLOSED. Visit their website for more information. SS4CU Hotline (561) 931-0006. In the event of an emergency, use this number to tell us of changes in your branch closures/re-openings or if your credit union is in need of distress assistance. Leave us: Your Name, Your Credit Union Name and at least 1 emergency contact phone number and we will return your call as quickly as possible.